Trainer Tanja Owe and her dogs Jake, Bailey, & Moo. Photo by Amy Sanderson. Owner and trainer Tanja Owe has been training dogs since 2013. Before starting her own business, she was a trainer at Spot On Dog Training in Washington, D.C., where she taught Puppy Manners, Family Dog Manners, and Reactive Dog. Tanja also has an M.S. in Companion Animal Behavior Analysis and Counseling. This program of study used Applied Behavior Analysis (ABA) to modify problem behavior. Tanja's coursework included Animal Learning and Behavior Analysis (I, II, and III), Companion Animal Husbandry, Companion Animal Nutrition, and psychopharmacology. She has also taken three species-specific courses in behavior and intervention: canine, feline, and avian. 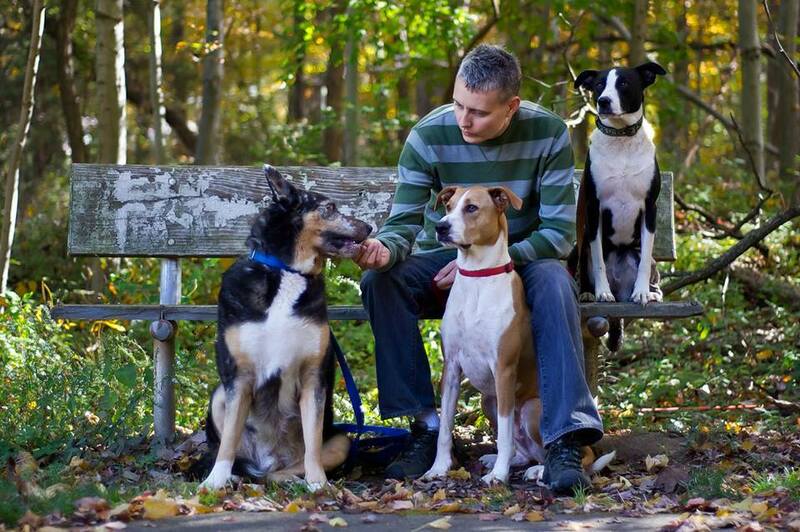 Tanja completed an externship at the Washington Humane Society in 2012. She completed a second externship at Spot on Dog Training in 2013. Tanja lives with her wife, three children, dogs, and cats. We were in the news! Trainer Tanja Owe was quoted in an article on Guide Dogs in the 19 October 2017 issue of the Greenbelt News Review. To view the article, scroll to pages 7 and 11 below.